From time to time, in the translation industry (I’m guessing in many other industries as well), there are trending topics and buzzwords that become hot topics for a period of time. A few years ago, the buzzword that all linguists were talking about was diversification: what it is, do we need it, who it’s suitable for, and ways to do it. Nicole Y. Adams offered some structure and food for thought for those discussions with her book Diversification in the Language Industry (published in 2013, 350 pages). Diversification is only for bad translators. I’m successful and make a lot of money from translation alone, so I don’t need to diversify. I’m not an outgoing person; I’m not comfortable selling or putting myself out there. I have no time to diversify because I don’t want my core activity (translation) to suffer. I trained to be a translator; why would I want to do anything else? I’d rather improve my existing translation business and become a better translator. Add a new language pair. Add another domain of specialization. 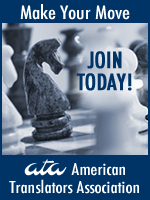 Become an expert in the fields you translate in. Embrace technology. Learn how to use the available tools. Collaborate; build a network of translating colleagues. They are not your competitors; they are potential co-workers. The book also offers definitions and explanations of four different types of diversification that have been identified in the language industry. Chapter 3 starts with an article and an interview on one form of linguistic diversification: machine translation (which is interesting information if you, like me, have never worked on such projects). One author, Jeana M. Clark, believes that “Diversification at the expense of integrity or translation quality is not the kind of diversification we want to pursue.” Then, there are articles and interviews on voice-over, subtitling, transcription, terminology (including a list of available training options), transcreation, copywriting, cross-cultural consulting, linguistic validation (including a list of the typical steps involved in the validation process), online language teaching, and interpreting. This is a really great collection of articles if you want to learn more about a specific industry and maybe start offering those services. Chapter 4 includes articles and interviews about extra-linguistic diversification, which includes services such as project management, blogging, social media, and online marketing. In one article, author Valerij Tomarenko writes about diversification through specialization, and in another, Inge Boonen talks about diversifying your client base. Chapters 5 and 6 are all about passive and external diversification (writing books and offering training services). Passive income can come from books, e-books or blogs, offering seminars/workshops and online training courses to fellow translation professionals, public speaking at conferences, consulting, website design, multilingual desktop publishing (DTP) and optical character recognition (OCR), and teaching. The book also includes an article on continuing professional development (CPD). Career coaching – Be a mentor, advisor and planner. Marketing – Teach people how to market themselves and what tools to use. IT – There are plenty of CAT tools that could be improved and applications, dictionaries, online databases and directories to be programmed. Teaching – Give courses, workshops and seminars on every aspect of a translator’s life, based on your experience. Art/design – Offer web design, promo materials, business cards, banners, posters. Chapter 7 is about distinctive diversification and includes articles and interviews on Mox’s blog and cartoons by Alejandro Moreno-Ramos, the money transferring service Translator Pay by Paul Sulzberger, the non-profit Translators without Borders by Lori Thicke, and branding services by Valeria Aliperta. 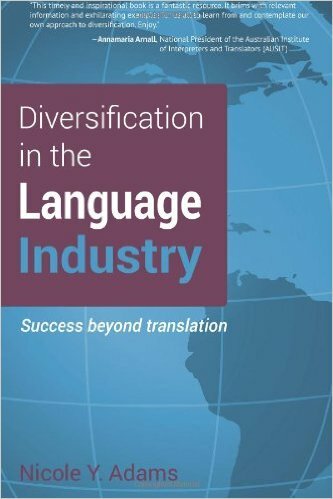 For me, the best feature of Diversification in the Language Industry is that you can you read it all at once as a book on diversification but you can also choose specific articles and chapters if you want to learn more about a specific field and/or skill set. The personal tone of most of the articles and interviews, including a brief background on the author, gives you great insight on how these authors started out and the different paths they followed in their successful careers. The food for thought this book gave to translators and interpreters–and all those discussions I mentioned at the beginning of this post–have led to many language professionals authoring books and offering training courses and webinars, as well as copywriting and consulting services. What about you? Have you read Nicole’s book? Did it inspire you to diversify and offer additional services apart from translation and interpreting?